At the midnight’s hour a sage’s soul came afire. In splendor he began to dance, a frenzied dance. A folded paper on my undeserving self! For I saw seven sparks wrapped in a silken paper. Then rapture overcame me and I dosed. I dreamed the dancing sage came to rest. With folded hands I humbly asked what gift is this? Pray, make me aware of this secret tonight! For God’s sake what will I do with the sparks? For if I keep them, they will burn the silken paper! The silken paper will burn, he said, the sparks will vanish. Seven spots will burn for years on the subcontinent. Rafiq Raaz who began publishing his ghazals in mid-seventies is without doubt our most talented ghazal writer of the younger generation who along with a handful of others is carrying the torch of modern day Kashmiri poetry which received a new life and became a passion of the learned after Mehjoor's departure by the efforts of a generation of poets whose tall figures are such as Dinnanath Nadim, Rehman Rahi, Ghulam Nabi Firaq, Amin Kamil and others. 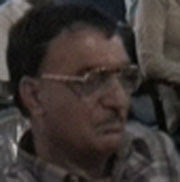 Rafiq Raaz dominated the new poetry scene during the eighties especially attracting budding poets to his style which has an immediate effect on the reader. His interest in new rhythms and meters, and his light vein subject matter popularized both him and ghazal writing among younger poets. Ghazal continues to dominate the poetry scene in Kashmiri. Rafiq Raaz published his first collection nay cha nalaan in 1995 which won him Sahitya Akademi award. His recent poems are included in the issue 19 of Neab. One of his recent poems can be read in April literary section of koshur akhbar. Rafiq Raaz has published three collections of poems, two in Kashmiri and one in urdu.